The Chair of the Steering Committee, Sue Felgate, welcomed all those present and thanked so many for attending the first Annual General Meeting of the Crouch End and District U3A (CEDU3A). The Vice Chair of the Steering Committee, Sally Whitaker, confirmed that the quorum of 65 members required to be in attendance at the meeting had been more than surpassed by the numbers present, estimated at over 100. In introducing the Constitution, which had been circulated to all members, the Vice Chair confirmed that it was based on the national Third Age Trust model and had been adopted by the Steering Committee at an early stage in CEDU3A’s development. The Constitution now required formal adoption by the membership. Questions regarding content were invited but none were forthcoming. Approval of the Constitution was proposed by David Barry and seconded by Chris Nicholson. A show of hands demonstrated overwhelming support. The Secretary to the Steering Committee, Jackie Langford, detailed the process by which nominations had been called for the appointment of Officer and non-Officer Trustees. The process had lasted one month from 11th February to 11th March 2019. All members had been given the opportunity to nominate others and all members could agree to be nominated. The list of those nominated was read out, and had already been made available to members together with the names of proposers and seconders. There were nine vacant Trustee positions to be filled and nine nominations had been forthcoming, including one nomination each for the four Officer Trustee posts. It was therefore confirmed that an election process did not need to be followed in the meeting. It was further confirmed that the Steering Committee would henceforth be designated the Executive Committee. Approval of the nine nominations was proposed by Alison Horton and seconded by Kathy McHale. A show of hands demonstrated overwhelming support. The Treasurer to the Steering Committee, Andrew Sich, delivered the Financial Report and Accounts for the period September 2017 to end December 2018. A written report and accounts had already been made available to members. He confirmed that CEDU3A’s income was derived mostly from members’ subscriptions. It had been possible to invest £8,000 of surplus income in a fixed term savings account, which was the equivalent of approximately 6 months’ worth of expenditure and considered a prudent move. Because subscriptions for 2019 had been paid towards the end of the previous year, total funds in the report needed to be viewed in the knowledge that expenditure throughout 2019 would be deducted from current funds held. Although CEDU3A was not required to seek a full audit of the accounts, one of our members, Paul Soper, had kindly undertaken to examine them and report his findings. His report was read out in full and would be included with CEDU3A’s submission to the Charity Commission for publication on their website. In response to a question from a member of the audience, the Treasurer estimated that by year end 2019 there should be between £8,000 – £10,000 funds in reserve. The Treasurer thanked Jayne Forbes for the excellent work she had carried out as his predecessor in that role and Anne Hutchings for her meticulous bookkeeping and records. The adoption of the financial report and accounts was proposed by Marie Campbell and seconded by Joan Lindeman. A show of hands demonstrated overwhelming support. The Chair presented the key points from a written annual report that had been made available to all members. She confirmed that CEDU3A currently had 662 members, 16 of which were concessionary, and that 82 had not renewed membership at the end of last year. Given that the CEDU3A had only been in existence since September 2017 the extent of current membership was a real achievement. Of the current membership, 98% used email and the remaining number were communicated with by post. The many conveners, who had made CEDU3A such a success, were thanked wholeheartedly for their ongoing efforts. Members of the Steering Committee (now the Executive Committee) who were not Trustees were identified for the audience and thanked for their ongoing contributions to the running and development of the CEDU3A. In looking to the future, there would be efforts made to increase diversity / inclusivity of membership, raise the profile of CEDU3A, mobilise more volunteers and expand social events. As an example of the latter point, it was announced that a Summer Garden Party was planned for 4th July. Members’ views on CEDU3A activities would be sought via another questionnaire in future. The Chair welcomed two newly appointed Trustees to the organisation, Diana Janus and John Hinshelwood, who would be replacing retiring Trustees Sue Picano and David Pashley. Warm tributes were paid to both retiring Trustees in recognition of the support they had given in ensuring the success of the CEDU3A. David, in particular, had left a legacy of over 70 active groups, led by roughly 100 convenors or co-convenors, a remarkable achievement in so short a time. Both retiring Trustees expressed their thanks and good wishes. The Vice Chair announced that, following David Pashley’s retirement as Groups Organiser, Diana Pavey would be taking over this responsibility, with Graham Bennett focussing on new group organisation. They will be supported in their roles by Ed Allen and Carl Parker. Further information would be circulated in due course. In response to a question from a member of the audience, asking why CEDU3A did not provide members with copies of The Third Age Trust’s quarterly magazine, when some other U3A branches did, the Chair replied that a decision had been made at an early stage that that the £3 per copy per member cost was not justified in terms of content. However, the Executive Committee would revisit this decision in the light of improvements to current magazine content. The Executive Committee would find out if individual members could sign up to receive a copy directly, provided they funded it themselves. There is also a monthly emailed newsletter which any member can sign up for on The Third Age Trust website. There was a request to re-visit the communications with those who do not use email. It was recognised that the flow of communication was much improved but some members were still missing out. The phone contact needs to be re-confirmed also. The Executive Committee would review this. No further questions were forthcoming but the excellent quality of CEDU3A’s website, compared to those of other U3A branches, was commented on by a member of the audience and agreed by others. The meeting was closed by the Chair, who reiterated her thanks to all of those who had attended. Patricia Adams, Jeannie Davidson, Frances Heidensohn, Anne Hutchings, Patsy Nightingale, Greta Sykes and Penelope Woolfitt. Here is an opportunity for anyone interested in getting involved in health research. VOICE, which has been running for years in partnership with Newcastle University, working with U3As in the North East, has now come to London in partnership with Imperial College. VOICE believe that the public should have a say in health research that may ultimately affect their lives and value the perspective that only community members can give. VOICE encourages collaboration between researchers and members of the public through a plethora of events, lectures, debates and discussion groups on a variety of topics. Most of their work is based at the Patient Experience Research Centre (PERC) at St.Mary’s, Paddington. The U3A is often asked to publicise research studies and trials to our members. Where we do so it is because we believe it may be of interest to you and we are not endorsing or promoting the research study in any way. Th U3A has not undertaken any checks or due diligence on the relevant department or the study and accepts no liability whatsoever if you decide to agree to participate. If you choose to take part in any study you do so at your own risk and in your own capacity (and not as member of U3A). You should make sure that you understand all the risks associated with any study before you sign up and ensure that you understand the time commitment, any restrictions and possible side effects. You should also ensure that you will be insured as part of the study. This non-residential event for U3A members offers 28 different talks, 4 workshops and 6 guided tours around the City of London. There is a wide range of topics taken from the themes of art, current affairs, history, literature, music, science and travel. The general theme is Celebration of the Sea. We are delighted to confirm the date and venue for our Summer Garden Party. It will be on Thursday 4 July from 4.30 p.m. – 7.30 p.m. at Crouch End Cricket Club in Shepherd’s Cot, off Park Road. Come and join other members (and their plus one) for a drink (pay bar), a bite to eat and some music in a lovely setting overlooking Ally Pally and the cricket ground. There is no charge although the event will be ticketed for catering and venue capacity. 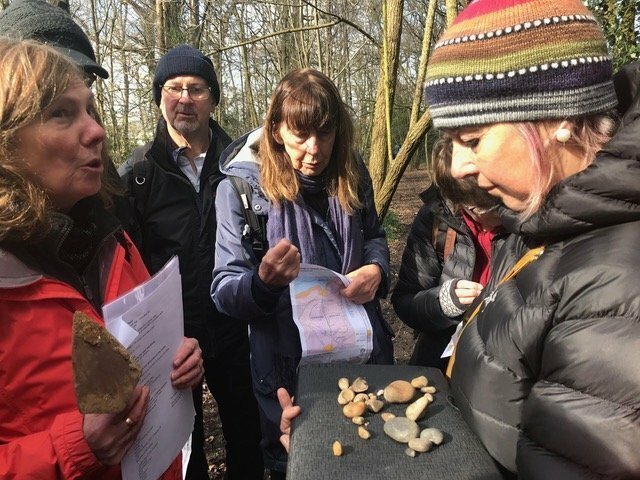 On 13 March 2019 members of the Geology Group went down to the woods and were in for some big surprises on a field trip to Highgate & Queens Woods. This was brilliantly led by our local expert Diana Clements. With her colleagues she has created an excellent display in the Highgate Wood information hut, the starting point for our visit. ◻︎ Towards the end of the Eocene seas became shallower & the river discharges sandier. These sandy deposits known as Claygate Beds overlie the London Clay in Highgate Wood This material made its way into locally manufactured Romano-British era pots & 19th century bricks. We saw fascinating evidence of the former in photographs of an excavated Roman pottery site & walked to the site. ◻︎ The youngest sandy deposits Bagshot Sands are near shore marine sands found on higher ground (Highgate Hill, Hampstead) but not in the Woods. ◻︎ Springs arise where gravel or sandy sediment layers meet impermeable clay. Our field trip included a pilgrimage to a handsome Victorian granite water fountain in Highgate Wood marking the outlet of one such stream. Those in Highgate Wood flow to the west (via the River Brent into the Thames at Brentford) whilst the more deeply incised streams in Queen’s Wood all flow eastwards (via the Moselle, then the River Lea to join the Thames at Bow Creek). The much more deeply incised valleys in Qween’s Wood were probably cut by glacial water flow from the melting Anglian Ice sheet 0.4Ma. Members of the 1960s Group had an afternoon’s viewing in April enjoying two DVDs showing life in London in the Sixties. The first film, in grainy black and white, showed life in the first half of the decade. London was a city slowly being rebuilt after years of austerity. Everything seemed to be a continuation of the past and more of the same. In marked contract was My Generation, the film created and narrated by Michael Caine. This was all about Swinging London, a magnet for the young who, for the first time, felt free and bold enough to follow their dreams, rejecting the expectations of their parents’ generation. The film was in vibrant colour, had a great soundtrack and featured some of the main players: actors, designers, hairdressers, musicians, artists and photographers They did say that Swinging London was just 300 people but their effect was overwhelming, global and enduring.